What if the Ukrainian government resumes the war noone wants to pay for – not the US, the European Union, Poland, Canada, least of all Kiev? Public statements by Ukrainian and international officials identify two payment deadlines for war, and for peace. The first falls on May 31, Natalie Jaresko, the US minister of Ukrainian Finance, has told the London Times, when $15.3 billion in sovereign bond debt must be written off “through lower interest rates, longer payment terms, and in some cases, a cut in the sum owed.” The second deadline falls a month later, at the end of June, when the International Monetary Fund (IMF) must decide whether the government in Kiev has met the conditions required for payment of $1.5 billion, the second instalment of the Extended Fund Facility (EFF) which commenced just six weeks ago. A default on May 31 will make inevitable a delay in IMF loan disbursement in June. The combination will halt the European Union promise to start a new €1.8 billion in Macro Financial Assistance (MFA). Russian sources believe that unless Kiev starts a new military offensive in the Donbass within days, when cross-border Russian action can be blamed, creditor governments pressured into paying and bondholders into conceding losses, there won’t be enough cash later on to pay for troops, machines and ammunition. A month later, her threat has proved unconvincing to bond-holders, a majority of them American. 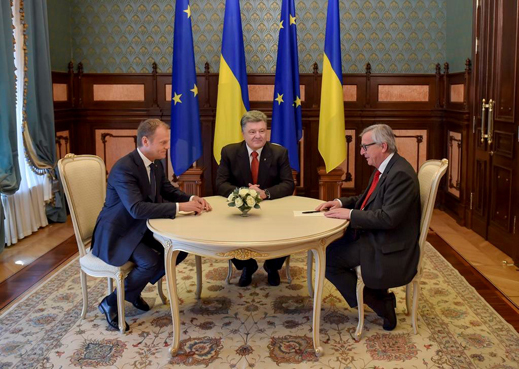 At Monday’s (April 27) summit meeting between Ukrainian President Petro Poroshenko (lead image, left), Donald Tusk, President of the European Council, and Jean-Claude Juncker, President of the European Commission, the EU was also unmoved. In a lengthy communique, the EU insisted on “decentralisation” of government in the east; “inclusive constitutional reform”; and “de-escalation and a political solution based on respect for Ukraine’s independence, sovereignty and territorial integrity, in particular in the framework of the Normandy format [and] the Minsk Agreements.” These are all provisos against the resumption of large-scale fighting in the Donbass. By the time the communique was released yesterday, the desperation of the Ukrainians and the reluctance of the Europeans were revealed in the word “swiftly”, inserted twice into the final communique, to make the unlikelihood of new money seem more adverbial, less subjunctive. Here they are in Point 8. When the European Council met on March 19, it said the speed at which the new MFA money would be paid to Kiev was dependent on, and “in line with IMF conditionality.” The IMF, however, is in no hurry. That’s why the European Council, Tusk and Juncker are willing to withdraw their “early 2016” target for disbursement, but add “possibly” to mention of a mid-2015 target. David Lipton, an apparatchik from the Clinton Administration, then the Obama White House, is the deputy managing director of the IMF under the French appointee, Christine Lagarde. He is what the Wall Street Journal calls the “critical conduit between the IMF and the U.S. government”. For his policy advice he is also the holder of the Polish Order of the Knight’s Cross. Lipton hinted at how difficult it is for the IMF to agree that the Ukrainian government can meet the IMF conditions to qualify for the second EFF payout. “There are key structural impediments in the banking system. These include an ownership structure that too often funnels excessive lending to insiders—often with sweetheart deals. The government is starting to address this issue with a strengthened regulatory and supervisory framework intended to bring the banking system into line with international best practices.” The irony of Lipton saying this on the tab of Pinchuk, whose Credit Dnepr bank is one of the beneficiaries of “insider deals”, may have been missed by the PIIE audience. It hasn’t been lost on the IMF Executive Board. Since Lipton’s remarks on April 7, the IMF convened its Spring round of meetings with board directors and finance ministers representing the Fund stakeholders. Fresh money for Ukraine was a subject passed over in near-total silence. Poul Thomsen, the director of the Fund’s European Department, conceded on April 17 that “we project recession [in the CIS area] this year, reflecting fallout from the conflict in Ukraine, ongoing macroeconomic adjustment, and, of course, in Russia’s case, lower oil prices and weakened confidence.” No more. At the conclusion of the finance ministers’ session of the Fund’s Monetary and Financial Committee (IMFC), there was no mention at all of Ukraine. In Lagarde’s (lead image, right; right) summing up for the press, there was calculated avoidance. “I would not want you to go away with the idea that everything is a risk and there are no bright spots, because there are bright spots in the global economy as we see it.” Lagarde went further: “Russia is clearly an important partner of the IMF and one with which we are working steadily and which we very much count upon to ensure certainty, stability in the region.” She ignored Ukraine. 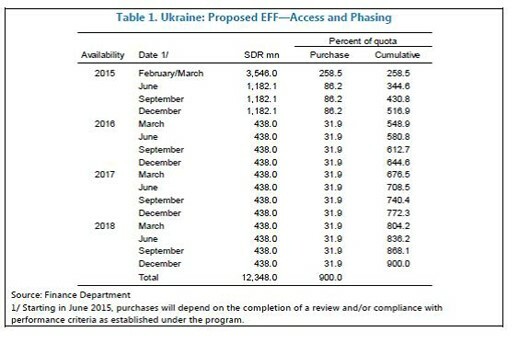 The footnote reveals that the IMF already acknowledges that the Ukrainian government may fail to meet the “performance criteria” which are the Board’s conditions for making further payments. Last year’s abortive IMF loan stopped in mid-year for the same reason, compounded by the opening of the Ukrainian Army’s offensive against Lugansk and Donetsk. For more on whether the IMF Board will countenance fresh loan disbursements during civil war, read this. In reserve, in case the board can be persuaded to ignore the war and the failure of Ukrainian EFF compliance, Lagarde and Lipton have agreed, according to the footnote, that the second tranche may become payable “on the completion of a review” by IMF staff – even if that concludes there is non-compliance and non-performance. The European Department’s analysts, Pritha Mitra (below, left) and Tigran Poghosyan (centre), have published an econometric analysis explaining why the performance conditions have what they call “a multiplier effect of less than one”. That’s IMF talk for bound-to-fail. Here’s the research paper, dated March 2015. Authorizing publication was Nikolay Gueorguiev (right), head of the Fund’s Ukraine review team. Gueorguiev supervised last year’s Ukraine loan failure without ever acknowledging there was non-compliance with the performance criteria. For Gueorguiev’s record, read this. Today’s Kiev conference programme can be read in full here. The speaker list includes senior officials of junior states; junior officials of senior states; and a great many US officials of the middle echelon. Not a single Ukrainian businessman of oligarch size appears, and only one foreign business figure of sizeable capital. He’s Jan Kulczyk (below, left), Poland’s leading oligarch. He is billed for a talk on “the Opportunities for International Investors in Ukraine”. Through a Luxembourg entity called Kulczyk Investments, Kulczyk’s principal advisors on the Ukraine are the ex-Polish president, Alexander Kwasniewski, who is also on the payrolls of Pinchuk and Igor Kolomoisky; and retired US Marine General and former NATO Commander, James Jones (right). Company officials won’t say where the current line of contact runs between the Ukrainian army and the Novorussian forces. Kulczyk’s minority-stake partners in Ukraine include Mikhail Afendikov, a Donetsk native and owner of CUB Energy, another Toronto-listed junior of negligible value; and the Pala Investments group of Vladimir Iorikh, the onetime co-owner of Mechel. Iorikh lives in Switzerland; his son Yevgeny occupies a seat on the Serinus board. The company financial reports show sales revenues of US$146.7 million in 2013; $164.3 million in 2014. The bottom line was a loss of $59 million in 2013; $58.1 million last year. Current market capitalization of the company is C$80 million (US$66 million), about half of what Kulczyk paid for Winstar two years ago. The value is falling because the market expects the financial position of the company to grow worse this year. The first-quarter results confirm it. Serinus’s vice president for investor relations, Jacub Korczak in Warsaw, was asked what proposals Kulczyk and his company are making in Kiev to address the financial problems identified in last week’s report to shareholders. He was also asked what relationship the company has with the Lugansk and Donetsk administrations since the start of the fighting; and what impact, if any, Serinus has experienced from the Dniepropetrovsk regional administration during the governorship of Igor Kolomoisky. The Canadian executives at the company office in Alberta were asked the same questions. They refuse to reply. This entry was posted in Banana republic, Banking industry, Europe, Guest Post, Politics, Regulations and regulators, Ridiculously obvious scams on April 29, 2015 by Yves Smith. So the “circle-jerk-loot-a-rama” continues unabated but not un-abetted by the IMF. I had something else but… . Excellent article, thank you Yves for shining light into the darkness. 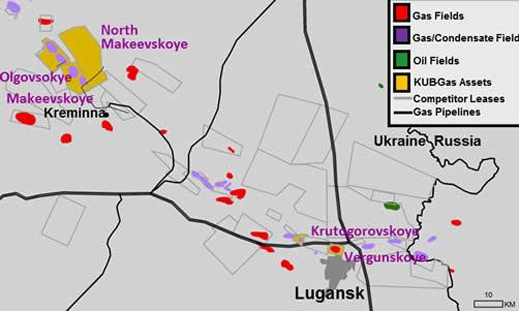 It doesn’t look like (little map of pockets of natgas) Ukraine is particularly rich in resources yet there is a frenzy going on to grab them. Isn’t this classic pump n dump? Private equity’s favorite business model. And a faux civil war is just a smokescreen. Oligarchs and politicians aren’t even going for resources anymore – they are just going for the capital. The new wildcatters. Complimentary marriage is the economic motor, which operates beyond the empire, in privacy. Contract marriage is the CEMF, or gravitational inertia keeping the motor from running away, which the empire employs to replace nature, poorly. At threshold, Nature re-engages. Whether you care to think so or not, the earth is a motor-generator, and time is a dc construct in your mind, only going one way, which can only blow up. If you look at contract marriage, from beyond it, you will see that the critters stay together so long as they acquire more stuff, which is why you see divorce at max potential, when the assets get recycled back into empire. The Clintons are just doing their job, fulfilling the contract, which is worth no more than 10% of your time, and upon which empire media spends 90% of its time, as the counterweight. NASA is just as pointless. If your idea of space exploration is finding another earth or taking a round trip to Mars, you are wasting/creating your time, with busy work. The empire is like a case study in artificial adaptation, training wheels. You will learn much more, more quickly, adapting to Nature, which varies with spacetime, which the empire busies itself eliminating. As you contemplate new infrastructure, you may want to think about the space you really want to explore. Only your children can take you to the future, regardless feudal mythology, which can’t do anything, but talk, print and go to war, History, written of, by and for feudalists, who must have your children to exist. You may want to re-think commercial lending, looking within deep subprime, which the feudalists are combing through now, expecting to grow green shoots with usurious interest rates, consuming accordingly. If you want to find needles in haystacks, be the needle. The critters scale up the past, locking the rotor into the stator every time. Those elevator doors are a double-sided mirror. The majority scans the environment for what it expects to see, with an increasingly myopic dc filter, which is why democracy degrades to communism. We would all be better off with economic circulation, mobility, but most seek the benefits of capital and labor with none of the costs, something for nothing, arguing equal rights, as needed, giving nothing. Capital employs the middle class accordingly, to systematically identify the 1% and place it in back, to maintain float, real estate control and inflation to maximize tax. That is what the Bell Curve, public education under the law, is all about. The empire isn’t a conspiracy of evil. It’s stupid breeding stupid, as the counterweight. Defining new classes does not add windings, as presumed to get the motor running again. So long as RE inflation exceeds wage gain, working, in the empire, merely bankrupts work. DC has simply consumed Baltimore with its gravity, urban sprawl to feed global cities. Have you been by Cal Ripken Park? What do you see in the mirror, other than the reaction to what you have been programmed to see since birth? Goliath doesn’t realize that he is at the edge of the cliff until his head is imploding at the base of the ravine, for obvious reasons, which History attests. You can always cut the line to the aggregate counterweight, if you prepare accordingly. The market simply shifts the illusion of weight, the baseline, toward capital, with technology, blowing itself up every time. Somebody has to walk up that hill with weight, to install the elevator. Of course the critters are going to employ your children for the purpose of extortion. Thank you, kevinearick, for a fascinating allegorical-electro-mechanical stream-of-current-consciousness essay. You wrote: “The majority scans the environment for what it expects to see, with an increasingly myopic dc filter, which is why democracy degrades to communism.” which I don’t quite understand. Democracy degrading to communism is a little absurd, since democracy within a system of gross disparity of wealth that we see all around us today is a joke. Communism at least has a chance at a positive evolution upwards from what we have in the world today, Even as the failures of socialist revolutions in the last century laugh in our faces, many of their successes still ring true, and after all, those ideals and successes are the very reason each attempted revolution was met with a firestorm of hostilities and wide-spectrum aggression by an more powerful capitalist world. Pastor – Padre Kevinearick might have a wee case of industrial exposure, both physical and mental.